Home / How many trees have YOU planted? How many trees have YOU planted? Planting trees is a small action, but with large and enduring results. According to the UN, a single tree is able to absorb, throughout its life, a ton of CO2. The more trees we have, the more we can restore the precarious balance of our planet. Trees act against global warming as they absorb CO2, greenhouse gas…while also providing other important environmental services. Such as food and shelter for insects and birds – they also help to recover part of the original landscape, avoid wind erosion and of water, purify the air in the cities, slow the water runoff in the face of possible floods, reduce auditory contamination and help to combat the heat island effect in the cities. Every time you turn on the light, your computer or move by car/bus/plane, you contribute to the emission of carbon (CO2) at different levels. This gas is released into the atmosphere – trapping solar heat and contributing to global warming. Trees naturally capture CO2 from the atmosphere during the state of photosynthesis and form carbohydrates, which are used in the structure of the plant, releasing oxygen (O2) as a by-product. Trees act as a carbon sink; storing oxygen in their branches, trunk, leaves and roots. On average, 2 medium trees will catch about 1 ton of Co2 during the first 50 years of their life. Every tree we plant or conserve makes a big difference and each one of us can do it. Trees prevent soil erosion and are home to many animal species in the world. They provide food as in the case of fruits and their wood serves to build houses and many other products. In addition to these scientific data, they are part of the most beautiful landscapes on the planet. In many parts of the world, deforestation – for reasons related to agriculture or urban development – has resulted in a wave of environmental damage an the extinction of species living on those trees. Fortunately, many citizens and organisations committed to the environment have taken the cause seriously, raising awareness and planting trees in areas that need it. 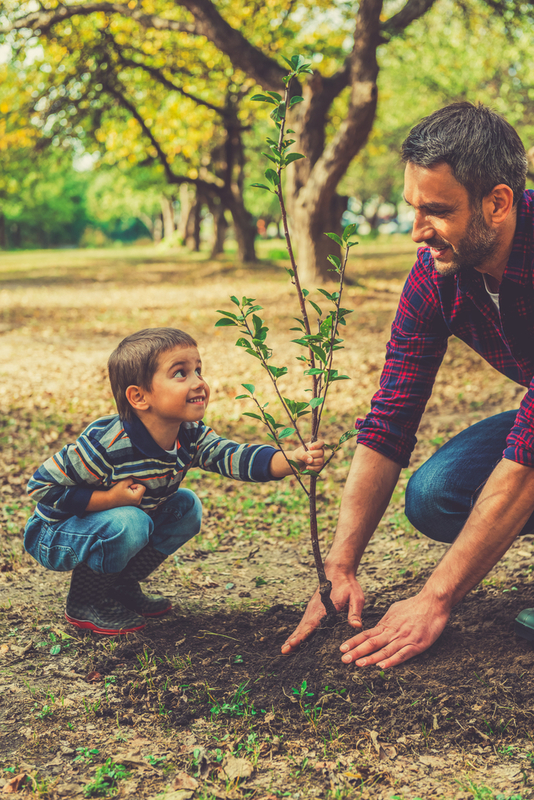 Here are 7 reasons for planting trees and collaborating to reduce the environmental impact on the planet. The leaves of the trees retain the dust particles that float in the air, avoiding our inhalation of them when breathing. Plant trees in a row, in this way they will act as a barrier against particulate matter in the atmosphere. 2. They oxygenate the air. The leaves fix the atmospheric CO2, which is a residual product of human and animal metabolism and the burning of fuels, in addition to producing large amounts of O2 necessary for life. Plants, in addition to photosynthesis, develop other processes such as evapo-transpiration. The leaves release water vapour that cools the air and moistens it. If you plant trees around your house you can cool it from 10% to 50%. This will reduce the use of refrigeration systems that also pollute the environment. The large masses of leaves function as dampers of the noise generated by the traffic, the industries and the functioning of the city. 5. They are small ecosystems. Each tree functions like a true ecosystem, on it live birds, insects and sometimes other vegetables that interact with each other. When you cut down a tree, hundreds of other living beings that inhabit it disappear. 6. They intervene in the water cycle. The roots retain the rainwater allowing it to slowly filter through the soil to the aquifers and move slowly to the rivers, keeping the flow stable and avoiding droughts and floods. 7. They protect the soil. They prevent soil erosion and wear, “holding” soil particles to their roots. Without trees, water drags the soil to other places. Therefore, they avoid water erosion – caused by water – and wind – caused by the wind. We are not alone in thinking that wood is one of the best fuels – it’s one of the most natural resources that humans have ever used. In recent years it has been dislodged by fossil fuels: oil, diesel, natural gas, butane, propane etc. However, we must be aware that these are sources of non-renewable energy, and that sooner or later these stocks will be exhausted. Wood belongs to the renewable sources of energy that are grouped under the name of biomass which include: firewood, shrubs, prunings, forest and agricultural residues, waste from the paper industries and manure too. Wood is also an ecological and sustainable fuel. While old trees can be felled, new trees can be planted, which means that wood is a sustainable fuel. The growth of trees is also vastly quicker than the millions of years it takes for fossil fuels to develop within the earth’s mantle. This makes it a more viable option for long term sustainability. A good idea is to reuse the wood, for example as heating fuel. In rural areas it is easy to accumulate a few thousand kilograms of wood to warm up in winter, and in our larger towns and cities this is made possible too, with companies like Firewood Fund bringing you the very best in British sourced, seasoned logs. Trees are the lungs of our planet and by destroying them, we are gambling the very ecosystem that we all depend on. As a civilisation we need to protect these supreme and mighty flag bearers of nature and make sure we keep on planting them. We should see it as our duty…as future generations may well find that it’s too late. It really isn’t too difficult to do your bit, so find out today where the best place near you is to plant trees and begin the fightback!